The economic meltdown of 2008 grew out of a foreclosure crisis, as Wall Street banks drove lenders to make loans that were then securitized and sold around the world, in an unregulated slew of credit products. This inflated a housing bubble that, when it burst, severely damaged an already weak economy, sent millions of homeowners into foreclosure, and put millions more out of work, leading to even more foreclosures as unemployed workers began to miss mortgage payments. Many homeowners who were able to stay in their homes now find themselves underwater -- owing more on their mortgage than their home is currently worth. But so far, the foreclosure prevention efforts undertaken by Congress and the Obama administration, while well-intentioned, have failed to produce widespread results. This not only hurts homeowners but undermines economic recovery. Proposals for a variety of more aggressive, and potentially more effective, measures have so far not been taken up, as the programs unveiled have often lagged behind the heart of the problem. According to analysts at Morgan Stanley, "Without more intervention, the housing market will continue its 'slow motion' adjustment that will continue to inhibit economic growth and drag down consumer spending." 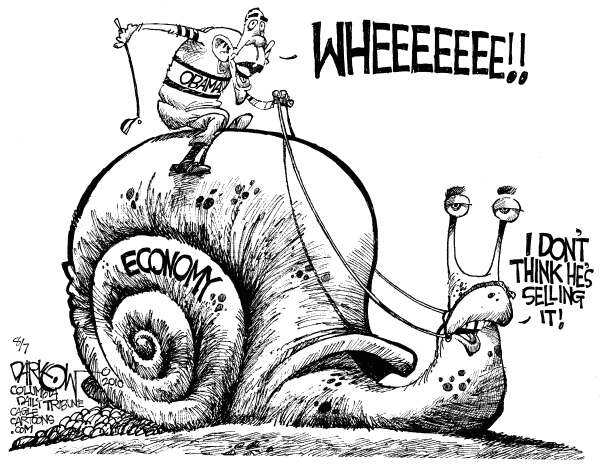 "It's certainly a weight on the economy," said Mark Zandi, chief economist at Moody's Economy.com. "Nothing works all that well in the economy when house prices are falling." 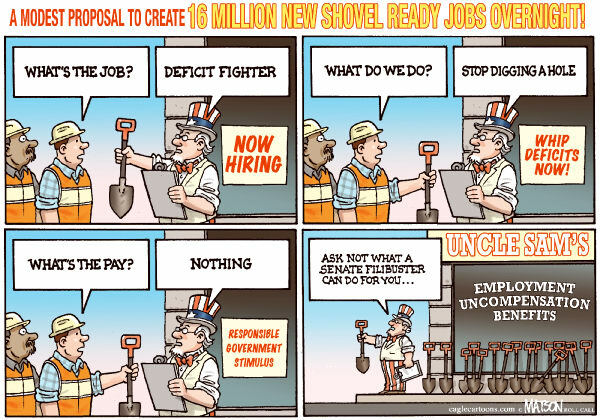 None of them want to fix it -- so high unemployment might become a habit. The deficit is largely a red herring - an issue being ginned up by the Republicans for the purpose of preventing Obama from making headway on economic recovery. They hope that anger and frustration over the ongoing crisis can be channeled into Republican votes in November. Real consumer protection against fraud and misinformation in financial services is something the "financial sector" has fought for years. The catastrophe that required a $4 trillion public fiscal and credit injection into the economy makes no impression on the people whose reckless, unregulated behavior caused it, and whose bread is now buttered with its spoils. What the NY Times is not telling you about the deficit. In a major editorial last Sunday (August 1) entitled "What They're Not Telling You About the Deficit," the New York Times offers at best a partial solution to the problem of the deficit. The Times justifiably criticizes the Republicans, who blame stimulus spending and extension of unemployment benefits for the deficit. The Republicans fail to mention the tax cuts they enacted primarily under the Bush administration to benefit the super-rich. Allowing the tax cuts for wealthy families to expire at the end of the year would generate $680 billion, a major chunk of the deficit that is expected to rise to $1.4 trillion this year. In an eye-opening, and at times hard-hitting article in Sunday's New York Times, President Reagan's budget director has slammed today's Republican Party for pushing to extend Bush-era tax cuts for the super-rich. Read more about What the NY Times is not telling you about the deficit. The rationale for NAFTA (North American Free Trade Agreement), which came into force Jan. 1, 1994, was Ricardian (after the Anglo-Italian classical economist David Ricardo, who thought that each country should specialize in the production that most suited its climate and other characteristics). Much of Mexico's rural population was engaged in maize and wheat farming, which is much more productive in the vast plains of the central United States and Canada than in Mexico's more rugged terrain. So the idea was to push the grain farmers off the land and move them into specialized fruit and vegetable farming, and into manufacturing which was supposed to be attracted to Mexico by the cheap labor of displaced farmers. While anti-immigrant groups use anecdotal evidence to erroneously claim<http://cis.org/UnemploymentAmongNativeWorkers> that legalization would be disastrous for the American worker, passing comprehensive immigration reform would not only strengthen the labor market, it would promote needed economic growth.